Home › WRITINGS › ARTICLES › Why can’t Muslims live under Sharia in our own lands? Always we hear the same tired arguments against Muslims having the right to live according to Islam. In Muslim countries, Muslims are told that we cannot implement and live by Sharia rights, laws and duties because there are [insert name of non-Muslim minority] and Secularists [Post-Colonial Muslims] who don’t want to live under the law. When it is told to them that Sharia is only for Muslims, they reply “its not fair to have different laws for people, and not every ‘Muslim’ wants Sharia”. If Secularists lived in 7th century Madinah, they would probably demand the Prophet Muhammed (saw) remove from the Constitution (sahifa) of Madinah the clause: ‘if any fall into dispute, refer it to Allah and his Messenger’ because Madinah has a Jewish minority which doesn’t recognise him as Allah’s messenger, or his claim to receive revelation. If they didn’t get their way, they’d probably set up a ‘Tamarod’ (rebel) movement and invite Abdallah ibn Ubay to lead it. But citing non-Muslim minorities as a reason to stop Muslims from implementing Sharia is just an excuse. Even if Muslims try to emigrate and create an area that is only Muslim, the Secularists would then say ‘how can you exclude non-Muslims from living there? !’ Indeed, they would never leave us alone. However, Western countries [mostly Europe and Australia] have no problem imposing Secular laws reflecting a majority culture over their minorities. Do you think France cared about its 10% Muslim minority when it banned Hijab in schools and Niqab on the streets? No. They are happy to impose on Muslims saying ‘you live here, so you must accept and believe in our values or leave’, even if Muslims don’t want to be forced to give up their culture, values, right to expression or beliefs. Islam offers their minorities the Jizyah (contract-citizen tax) in return for not obliging military service nor changing ANYTHING of their beliefs, culture or LAWS. But unfortunately paying the Western ‘Jizyah’ (citizenship tax) doesn’t give you the same rights Islam does to its minorities. And why do Muslims have to respect the wishes of Secular ‘Muslims’ above their own wishes? Why can’t Secular ‘Muslims’ respect the rights of Muslims who believe in Islam AND want to live by it? Surely superior respect should be due for people who are sincere in their beliefs and wish to follow them? I mean, if you say you’re a Muslim, but you DON’T want to live by Islam, then why call yourself a Muslim? Is this not hypocrisy (nifaq)? To believe in a purpose of life, but reject wanting to live LIFE by that purpose? [This is different to being a sinful Muslim, who wants to live according to Islam, but does bad actions]. So in the end, Western and ‘Muslim’ Secularists don’t want Muslims to live by Islam ANYWHERE in the world. There is no winning in trying to please Secularists, so Muslims should stop trying to please them, and take control of our own destiny and implement Islam without anyone’s permission except Allah’s (swt). You either please the Hypocrites (Munafiqeen), or you please Allah (swt), but you can’t please both. What are you advocating here? “Own land” meaning the UK, and implementing it illegally in communities? meaning Muslim majority countries – don’t know where you got ‘UK’ from. Post has a clear concept,there is no doubt in implementation of shariya in their day to day or in life routine. I wish there were more muslim intellectuals like you. Your very concise and meticulous in your arguments. Just a question: Why don’t you publish your arguments in a national newspaper (I.e guardian newspaper). You’d make a really good public commentator! its because we don’t want muslims to be suppressing themselves, and others. Like you guys are totallyyyy going to create a society that promotes freedom with sharia, and you guys are realllllyyy going to have a society that isnt oppressive. Yeah, we don’t believe you. You want sharia law why? SO you can become just like Saudi Arabia, (the place the house of Allah is kept) the holy country. You want to ban women driving force them to wear niqab and burka and kill anyone who does one thing wrong? Indeed the ayat “there is no compulsion in religion” must be wrong. You want a place where slavery is allowed and women are forced to stay at home. 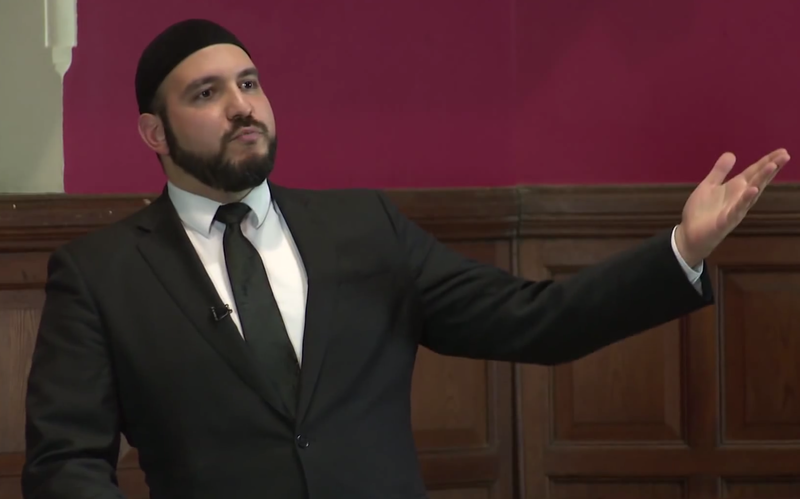 Mashallah brother, you really are preaching excellent stuff! Sir i am so glad that i found your lectures just on right time, i am a student and nowadays i am working on my thesis work on copy writing for that i have to write a research and my own thoughts to proof my topic, and guess what my topic is ‘Sharia law or Democracy? well i thought it would be easy to proof my point but its not, i did a lot of research on sharia law 80% material that i found on internet is anti sharia law, that’s funny! I live in a country where majority is Muslim, and its really hard to explain to my teacher that Sharia is way better than democracy, and there are many examples in my country that tells that those people who demands sharia they gets punished for it, and if i put these examples he says ‘you cannot force people to implement sharia’ and honestly for me that was just an excuse, because demanding sharia doesn’t means you are forcing people, well now a days i am learning what sharia is actually and i am loving it, I am only having problem in making poster on my topic, i don’t know how to express my topic in to one strong ‘Caption’ that tells the whole story (SHARIA IS BETTER THAN DEMOCRACY), so that i can create a good image. I think there is no such poster work in favor of sharia. Its Quite sad.